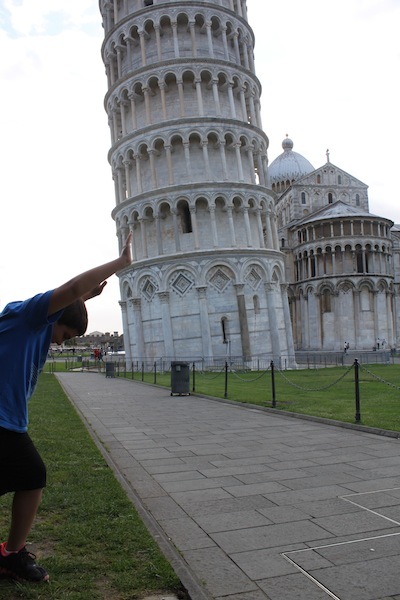 Today we went to the Leaning Tower of Pisa, which was about 2.5 hours from our Villa. In route to Pisa, we had lunch at St. Gimignano, where my Dad had a fender bender with a local Italian woman. Interestingly, another driver had just hit her before Dad hit her. Fortunately, there was just a small scratch on her car and we were able to settle up without having police involved. Next on to Pisa! It was so cool when we first saw it because we had no idea that it would be leaning so much. Also, it’s not that tall—only 186 feet on the leaning side and 194 feet on the tall side. We climbed to the top and we could feel ourselves off balance. As we climbed the spiral staircase we could feel ourselves leaning with the tower. We learned that the Tower sat unfinished for 100 years before an architect figured out how to finish it without it falling over. The picture to the left is my Mom and me at the top of the tower. This was my favorite site in Italy so far. push, Gabriel! 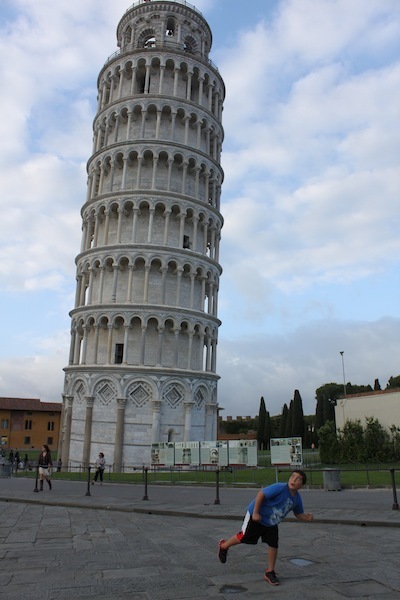 I never imagined that people were allowed to go up in the leaning tower. You were in one of the wonders of the ancient world! That's cool! !